The “Blog” of “Unnecessary” Quotation Marks: what kind of "experience"? Martin saw this one in Miami beach. Thanks to Gov. Spitzer, my mind was already in the gutter. Maybe they just mean a waitress who can fake like she knows what's going on. Oh boy. This sign sounds so shady. "Experience"… Night Shift … Ask for More. I think I better say a few Hail Mary's. What you're missing is context. This is obviously an ad for the new Jimi Hendrix Stone Crab Grill. I really like how at the bottom it says "Ask for more." It doesn't seem related to the job posting, it's just good general advice, tacked on as an afterthought. Hmmm...."experience"....it's all relative, I think. My mind went right where bethany's did. I think that says "Ask for Moro," not "Ask for More." "Moro" being a name, apparently. fantastic site. Keep em "coming". 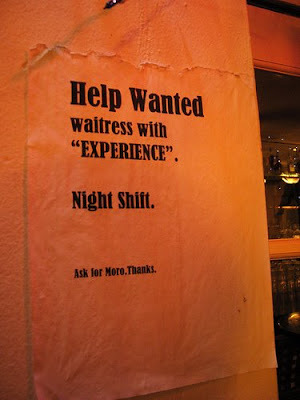 I think what the ad means is: we need a waitress with "you know what type" of experience, for the "night shift". in this case, the quotation marks could be a substitute for that smart eye-blink. i mean: "love" this "blog". TEE HEE! This one is so dirty I don't even know where to start!